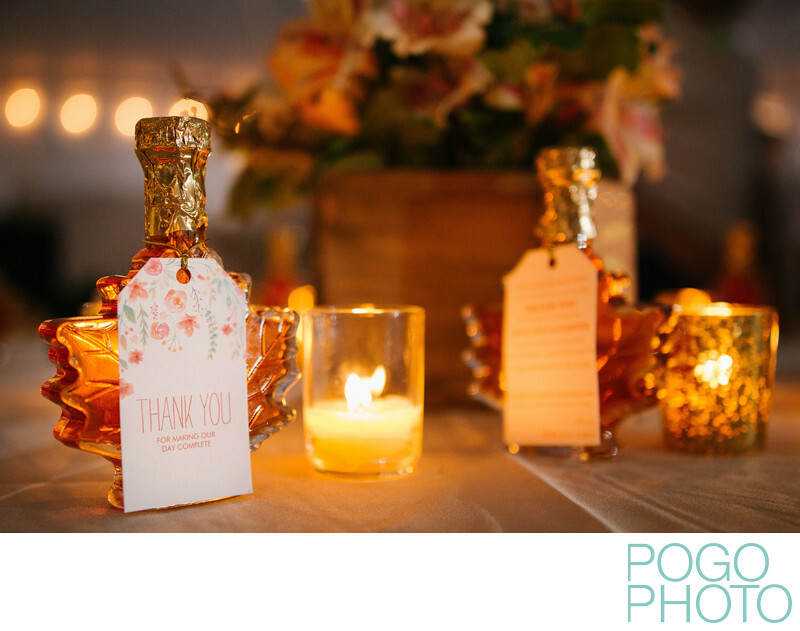 As photographers, capturing small details throughout the wedding day help us tell the story of the day through photos, and maple syrup wedding favors like these in Waitsfield are the perfect opportunity to let guests take a little bit of Vermont home with them. Selecting a wedding favor is frequently one of the last steps in the wedding planning process. In Vermont, some common options include cheeses, cookies in the shape of the state, or tables full of candy to give guests the ability to choose exactly what they would like. Some Vermont specific favors can be from Red Kite Caramels, Lake Champlain Chocolates, or any of the wonderful treats available from Sugarbush Farms in Quechee. The state may be famous for Ben & Jerry’s, but ice cream doesn’t travel particularly well, although attempting to check it in your luggage has the potential to be memorable, at the very least. Maple syrup is synonymous with the state of Vermont, much in the same way the maple leaf reminds people of Canada. One of the sights tourists can enjoy from the comfort of their cars along a road trip through the area are the blue lines running from tree to tree, collecting the sap. Knowing that forty gallons of sap boil down to one gallon of syrup may be a fun factoid, but the experience of being in the sugaring house while that process is taking place is the truly memorable part. The sweet, tantalizing aroma envelops the room completely, much like it does the memories of those around. The maple syrup wedding favor might wind up on a stack of pancakes somewhere back in Wyoming, but the memories it jogs will always bring them, at least in spirit, back to Vermont. For the full Waitsfield experience, feel free to have a winter wedding and bring us along for some photographic fun. Skiing nearby Mad River Glen or Sugarbush Resort make for great activities during a wedding weekend or as excursions surrounding an elopement or weddingmoon. Stopping by the Waitsfield based American Flatbread for a slice of pizza is a must; if you're truly a lover of excellent woodfired pizzas, they also cater weddings. American Flatbread Company may be the biggest name in Waitsfield and the surrounding Mad River Valley for that matter, but the restaurant scene downtown has become more famous, thanks in part to their wood fired pizza-oriented big brother. Follow your nose to the smokey sensation that is Mad Taco. One of the lessons we have learned traveling across the country is to never judge ethnic food based on how far away it is from its geographical origin. We had killer Mexican food in Fargo, North Dakota of all places, and here in Waitsfield, Mad Taco is a force to be reckoned with, even though it’s fifty times closer to the Canada than it is to Mexico. Be sure to try their many house-made hot sauces, but consider yourself warned: even though this isn't a part of the United States known for spicy food, even their medium hot sauces pack a firey kick. Numerous out-of-town couples choose Waitsfield as a destination for their wedding, but once there they can act like locals and support the local economy, all the way down to tiny leaf shaped jars of maple syrup as favors. Location: The Inn at the Round Barn Farm, 1661 E Warren Rd, Waitsfield, VT 05673. 1/200; f/2.0; ISO 2000; 35.0 mm.